(Nanowerk News) Market leaders in temperature controlled microscopy, Linkam Scientific Instruments, have been chosen by the Polymer Technology Group of the Dep. 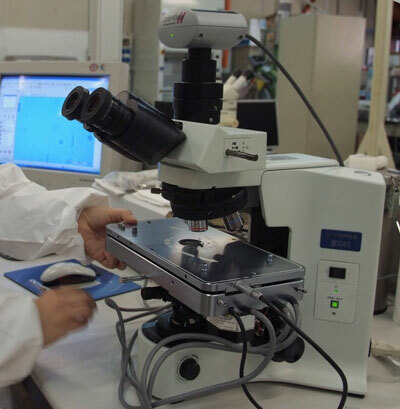 of Chemical and Food Engineering of the University of Salerno as suppliers of a controlled shear system to study the effect of temperature and steady shear flow on the nucleation rate of spherulites in isotactic polypropylene. One of the research programs of Professors Giuseppe Titomanlio, Roberto Pantani and their colleagues at the University of Salerno is the study of polymer crystallization enhanced by flow. This has attracted much interest because it implies the possibility of controlling the final morphology and the resulting mechanical and functional properties of semicrystalline polymers. An improved understanding of the fundamentals of flow-enhanced crystallization effects can help to tailor advanced transformation processes like injection-moulding and extrusion. Indeed, during these processing operations, the polymer melt is subjected to complex and intense flow fields (shear, elongational, or mixed) during or soon after which the polymer crystallizes. The crystallization kinetics and the morphology of the semicrystalline polymer in the final product, and subsequently its properties and quality, depend upon the orientation of the melt by effect of the flow. Linkam's optical shearing stage mounted on an Olympus microscope at the University of Salerno for the study of rheological properties. The observation of changes in morphology and the measurement of nucleation density under both steady shear and quiescent conditions were performed using a polarized light microscope (Olympus BH-41), equipped with a Linkam shearing cell, CSS450. The Linkam system was chosen for its ability to accurately control changes in temperature and shear rate on the micro scale. The group of the University of Salerno was able to show clear differences under different shear rates and temperature cycles which provided different thermal history to the samples. Professor Pantani said that "Prior to our having the CS450, understanding the analysis was just qualitative. Now we are able to complete unique quantitative analyses. We have been able to calculate the evolution of the nucleation density during the crystallization under shear using our own specialised image analysis software. The values of nucleation rate were obtained by a linear fitting of the evolution of nucleation density for all the shear rates and temperatures applied in this work." The CSS450 optical shearing system allows structural dynamics of complex fluids to be directly observed via a standard optical microscope while they are under precisely controlled temperature and various shear modes. Using the cell, it is possible to study the microstructure evolution of complex fluids in great detail for many physical processes, e.g. coarsening of binary fluids during their phase separations, flow-induced mixing and demixing of polymer blends, defects dynamics of liquid crystals, aggregation of red blood cells and their deformation by effect of flows etc. It is then possible to correlate the micro structural dynamics with rheological data thus gaining insight into the rheology of complex fluids.